Design blogs blew up this week when the news hit that Patone’s color for 2015 was Marsala. This color reminds me of Dusty Rose from the ’80s. Not a good look. Could someone please explain to me what is going on in the picture below. What is Pantone trying to say? The gentleman in the apron looks salty. Why? Perhaps he’s not feeling the color either. I’m very curious to see how this color choice plays out in fashion and home décor trends next year. I don’t think it’s an easy color to wear. For the home, I love the color of Marsala wine which is a deeper burgundy than this color. That rich color would be fantastic. My Sicilian uncle would have loved that apron. I agree. 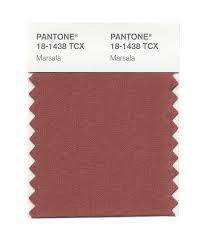 I think a deeper, more rich version of “Marsala” would be gorgeous. This falls flat for me. So flat. It doesn’t look anything like the wine.